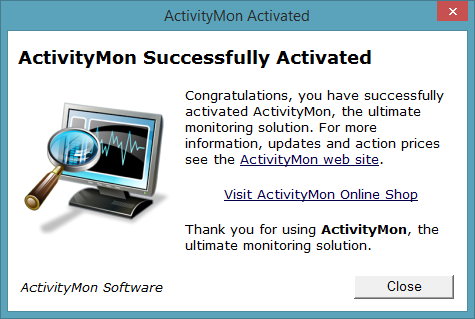 To activate ActivityMon you will need to have activation key. 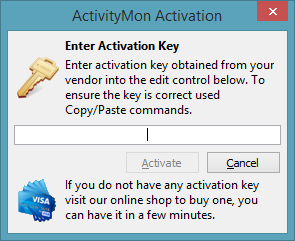 If you do not have one visit our online shop where you can purchase activation key for the product you need. For more information about available products and their features see their comparison. 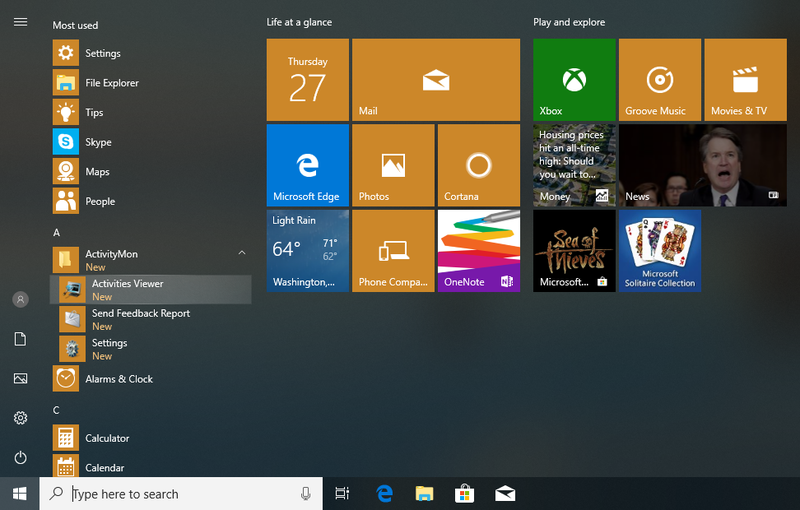 When you have your activation key you will need to start Activities Viewer: go to the Start menu, select All programs item in it. From the shown list of programs folders select ActivityMon and then click Activities Viewer. Activities viewer prompts you for the activities data file access password on its startup. Enter it or you can simply click the Cancel button (in such a case no activities will be read but we do not need them for activation purposes). Now switch to the ActivityMon tab and click the Activate... button. Activation dialog will appear. To the dialog text box carefully enter your activation key or use Copy&Paste clipboard functions to be sure the entered activation key is correct. Then click Activate button. If you entered activation key properly and it is correct dialog with congratulations will be shown to you. In the other case you will be informed about invalid activation key has been entered and you will have to try it again. Check the entered text and make sure you have not misspelled some character.